The Jewish community from poland would give you a quick answer to that question. NO! 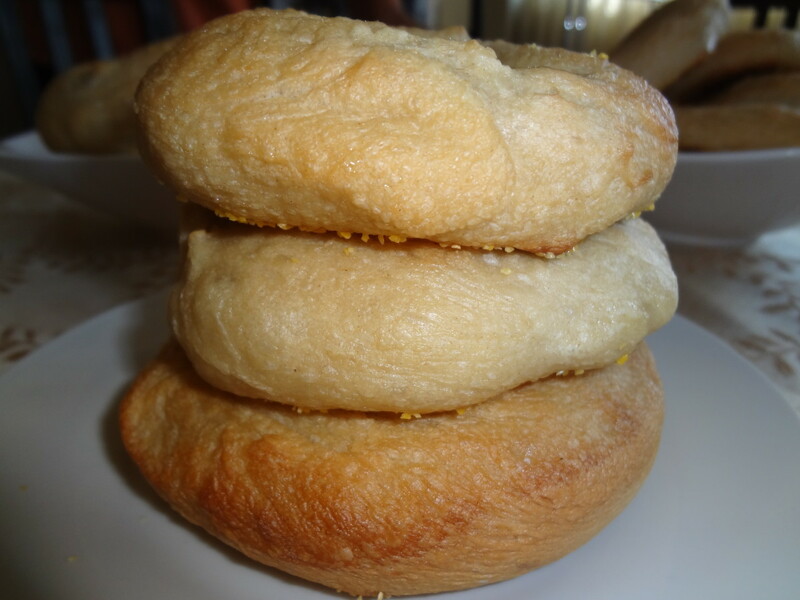 Bagels were given out at circumcisions and at child birth, the round bread witha hole represented the circle of life. 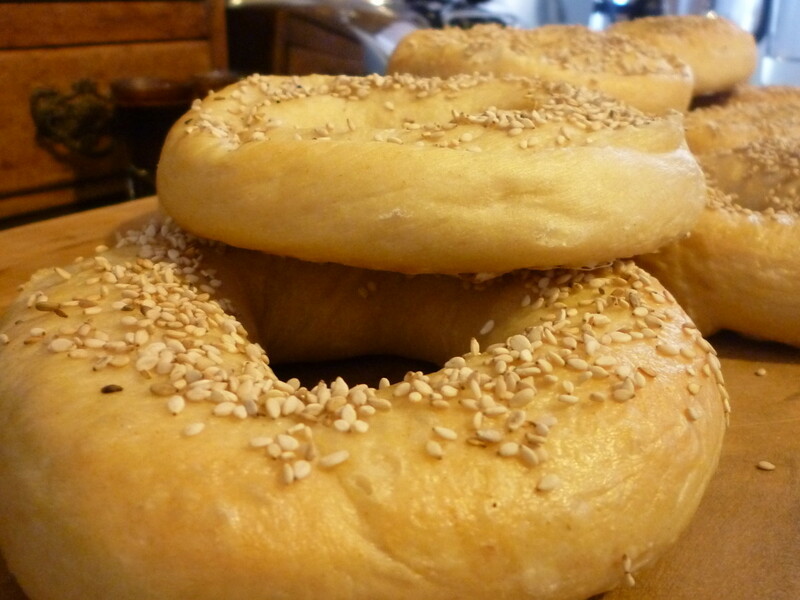 Bagels arrived in New York in the 1880s, with the immigration of hundreds of thousands of Eastern European Jews. Vendors used to thread the hole-shaped bread onto dowels and hawk them on street corners. William Safire wrote in the New York Times in 1999, "A sea of change in American taste took place at the beginning of this decade. The bagel overtook the doughnut in popularity. 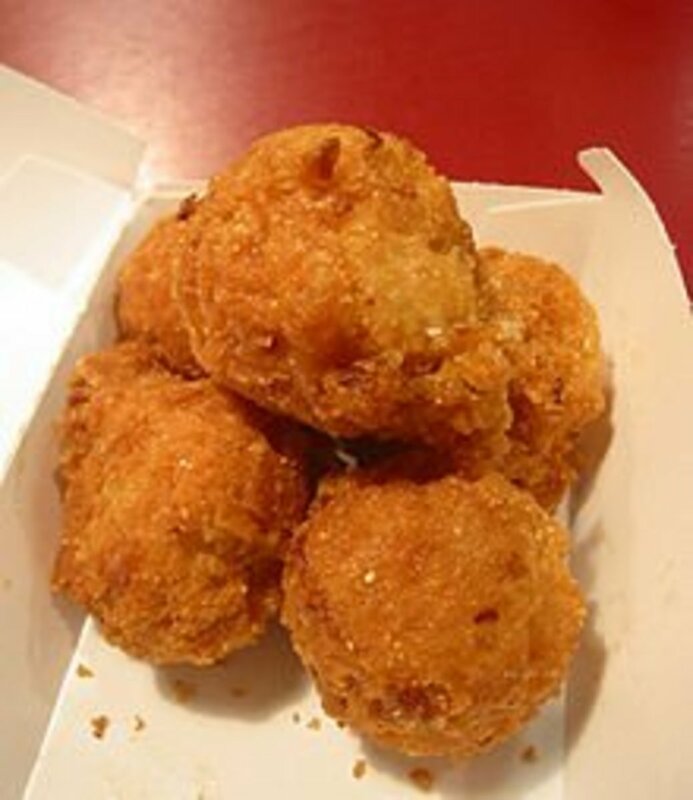 Today we spend three-quarters of a billion dollars a year on bagels, only a half-billion on doughnuts." 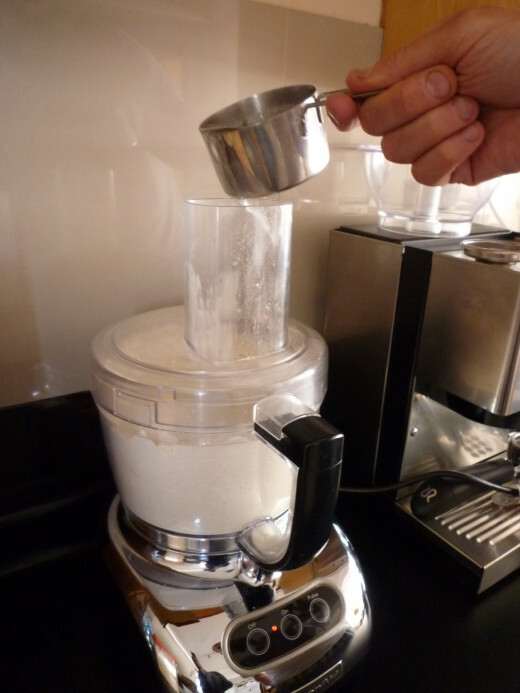 Place all the dry ingredients into your food processor with the dough attatchment on. 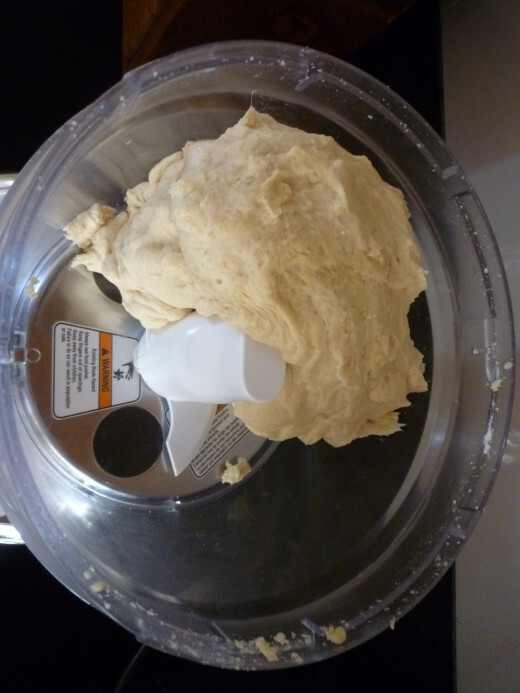 switch the machine on and then add the wet ingredients mix until a sticky dough is formed. 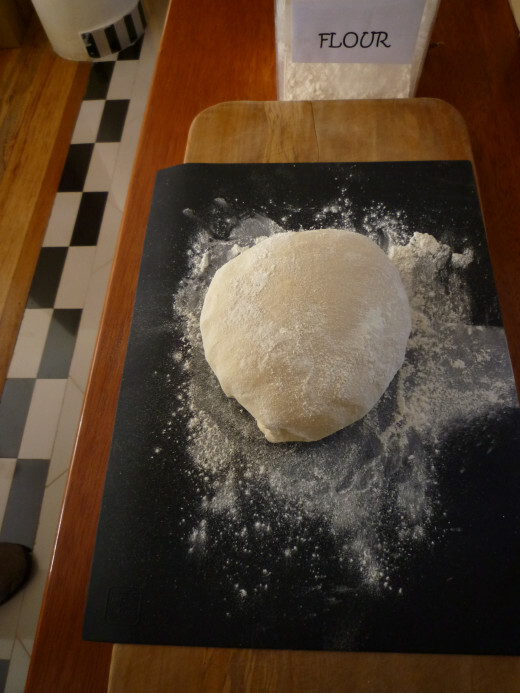 Empty out onto a lightly floured board and knead by hand for about 3 mins. leave to rise covered with plastic wrap for about 20 mins. 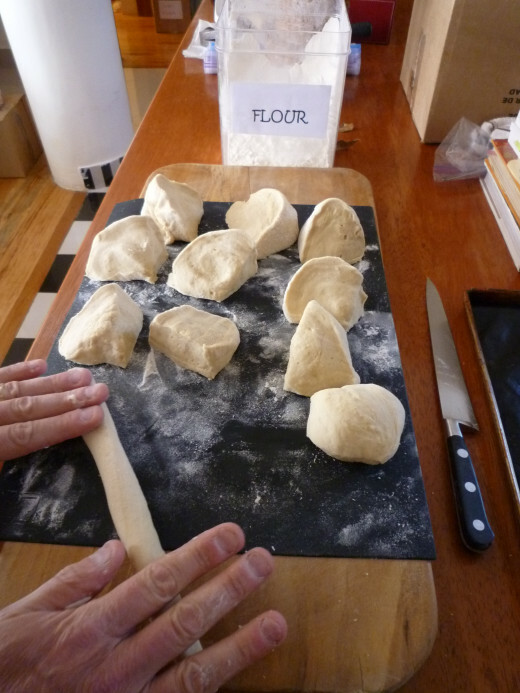 Devide the dough into equal portions. This mix will make around 12-14 decent sized bagels. 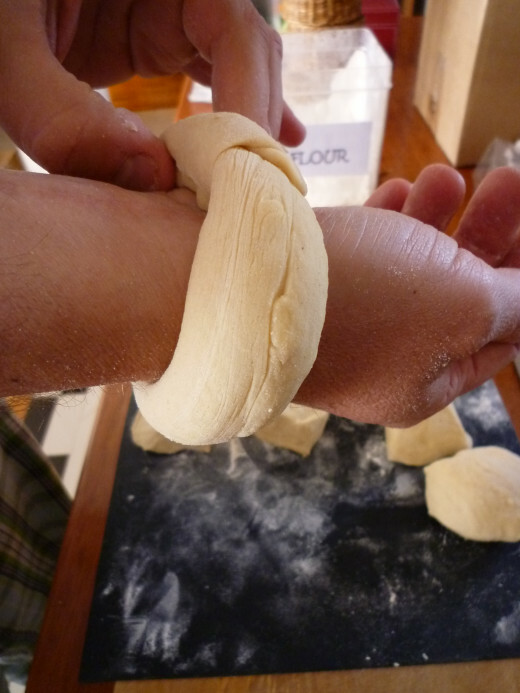 Roll each portion intp a long snake shape. 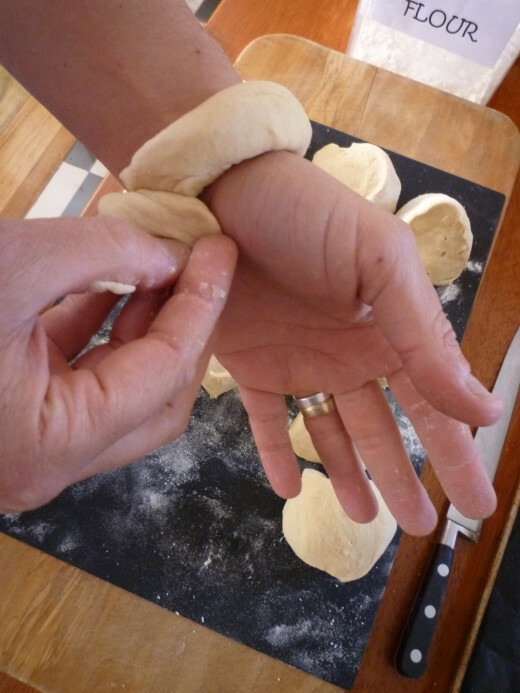 Wrap each dough snake around your wrist and nip where both ends meet to join them together and place on a baking sheet lined with plastic wrap or Teflon Sheet. You should now have a Bagel ring. Preheat the oven to 375 °F. Bring a lage pan to a rolling boil and add 2 teaspoons of salt. 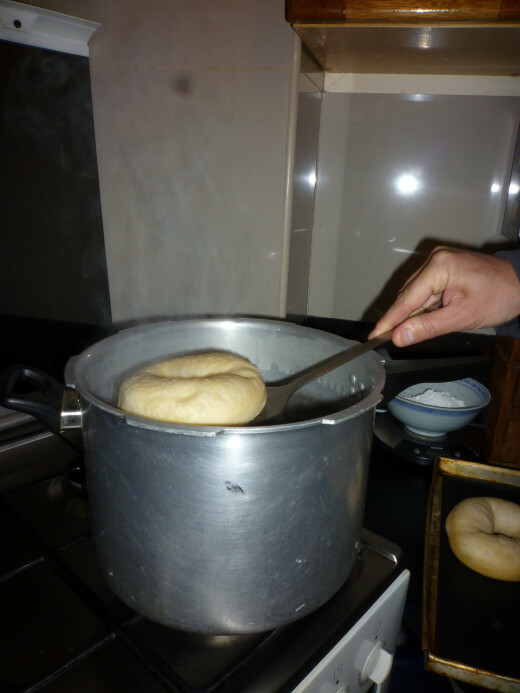 Carefully add a couple of the bagel rings to the boiling water. 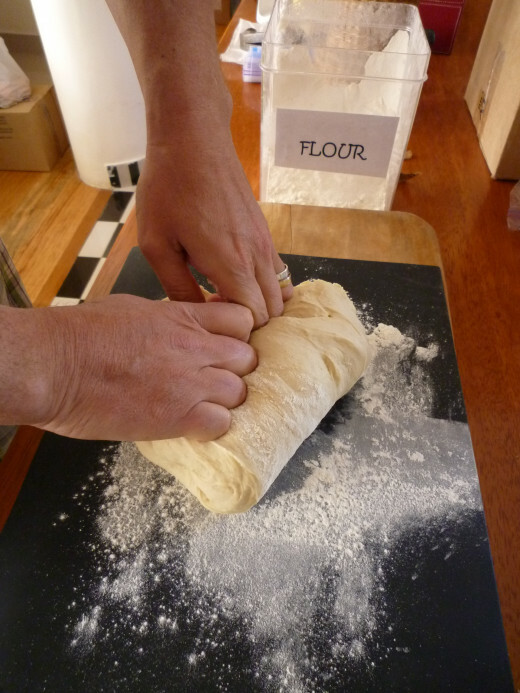 Use a slotted spatula or carefully drop in with your fingers. 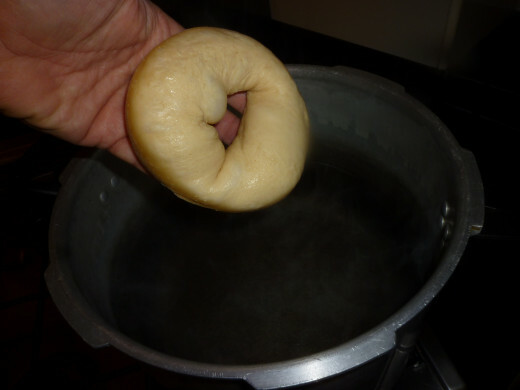 The bagel will sink to the bottom and then float within a minute or so. 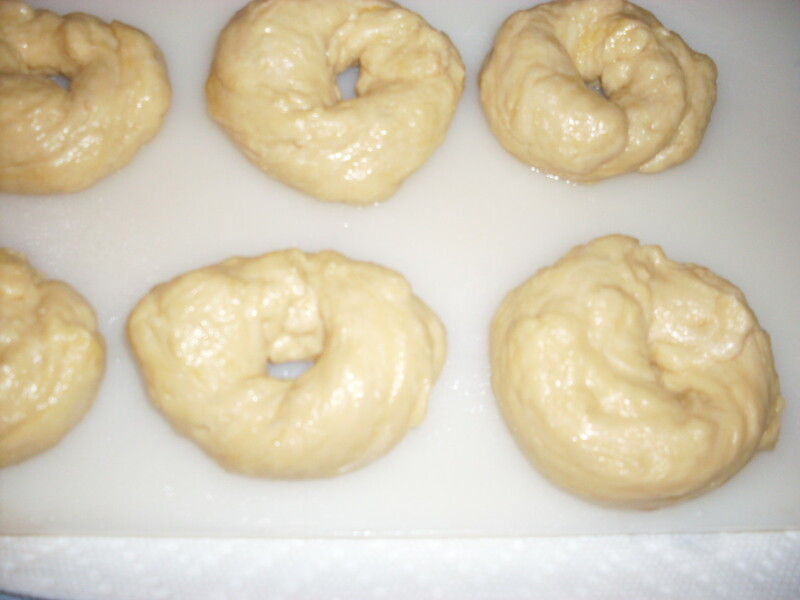 Time 4 mins from drop then flick the bagel over and leave for another 3 mins. Take out with the slotted spatula and place back on the baking sheet with Teflon Sheet to prevent sticking to the baking sheet. 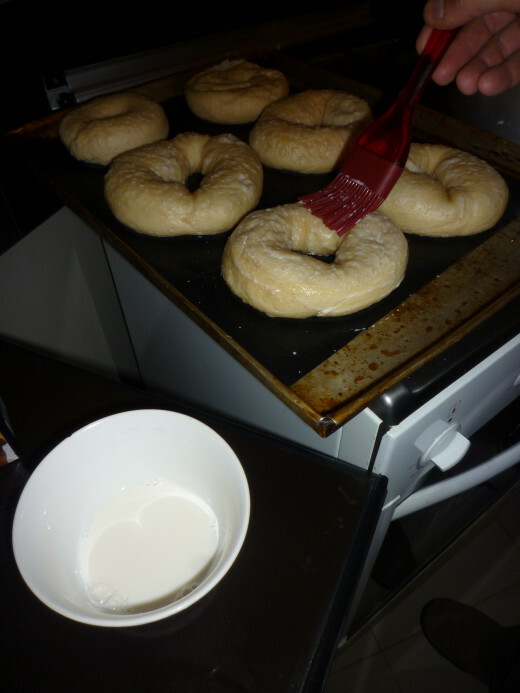 Brush the bagels with milk or an egg wash, then sprinkle with your desired toppings. Place in the oven for 30-35 mins or until golden brown. 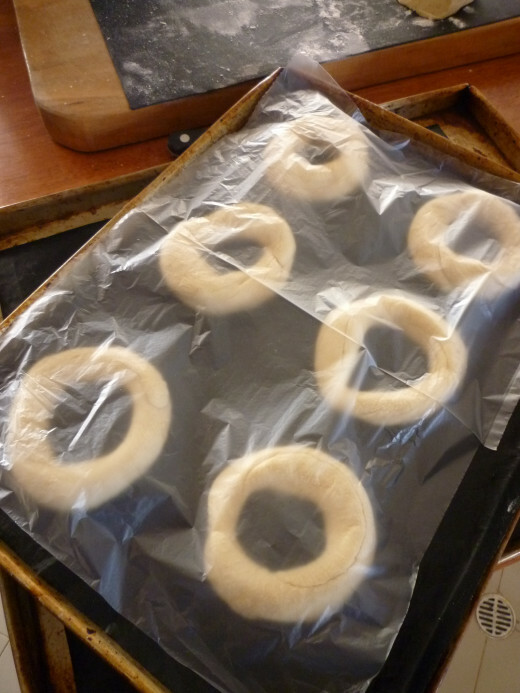 These bagels are good frozen for up to a month. 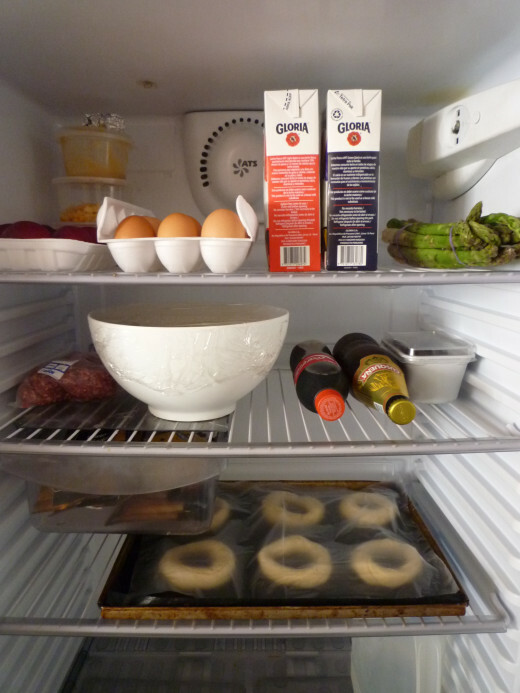 Brush with an egg wash before baking. 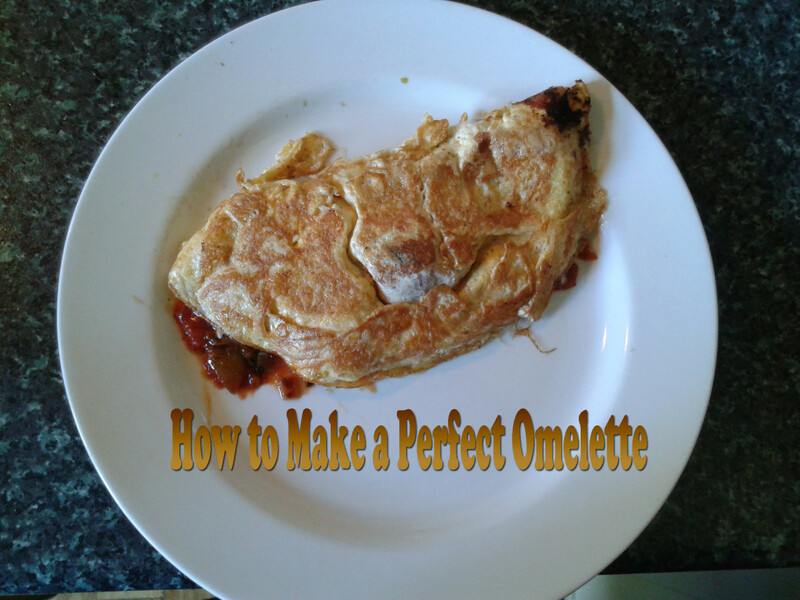 (1 egg mixed with 2 tablespoons of water). Sugested toppings: Sesame seeds, Poppy seeds, Quinua. 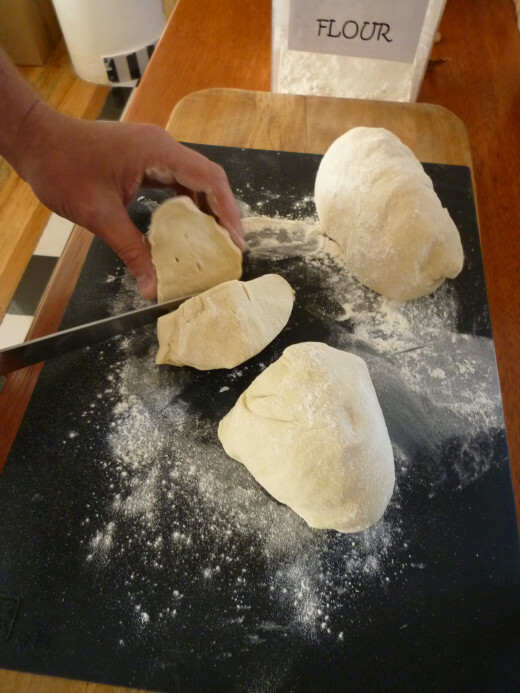 When the dough is nearly done, add another ingredient to suit your taste. Pre cooked cold diced onion, poppy seeds, grated cheese, dried fruit pieces, nuts. 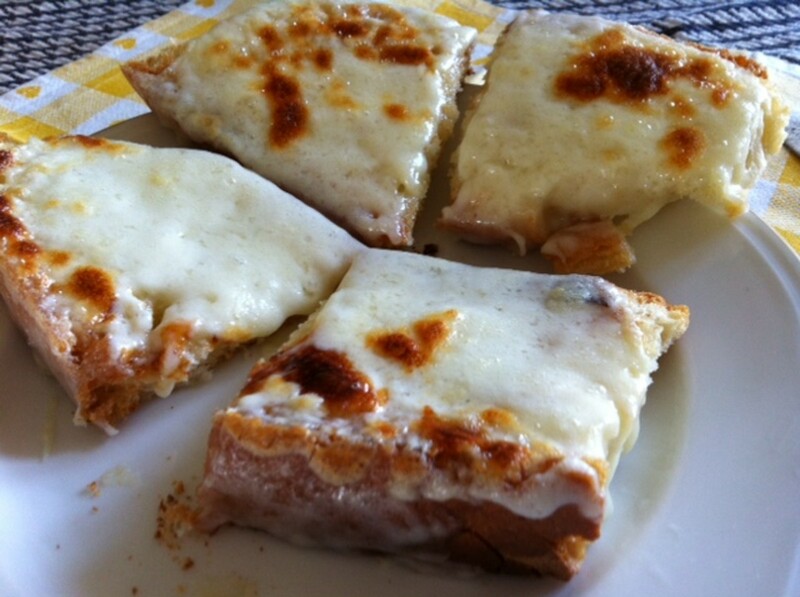 Toast your baked bagel and smother in cream cheese and add a slice of smoked salmon. I used to think they were difficult to make....deffinatley not worth having a go ! 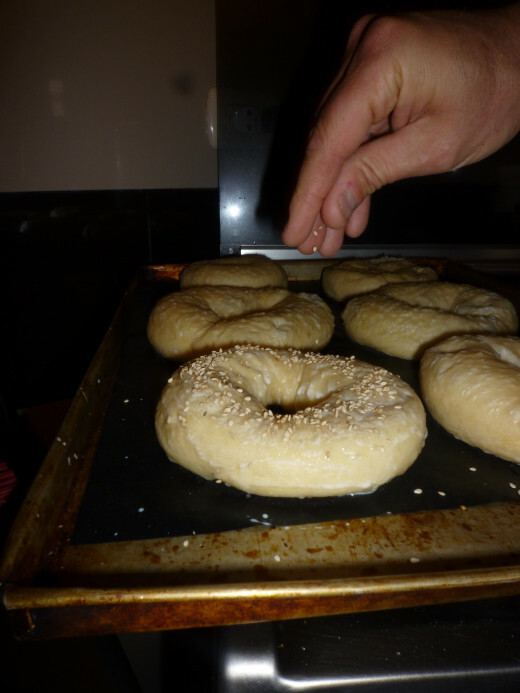 it is very true NateB11, there is nothing like knowing you actually made your own bagels. somebody told me Bagels were difficult to make but once you have done the process once they are really easy, have a go and let me know how they turned out. 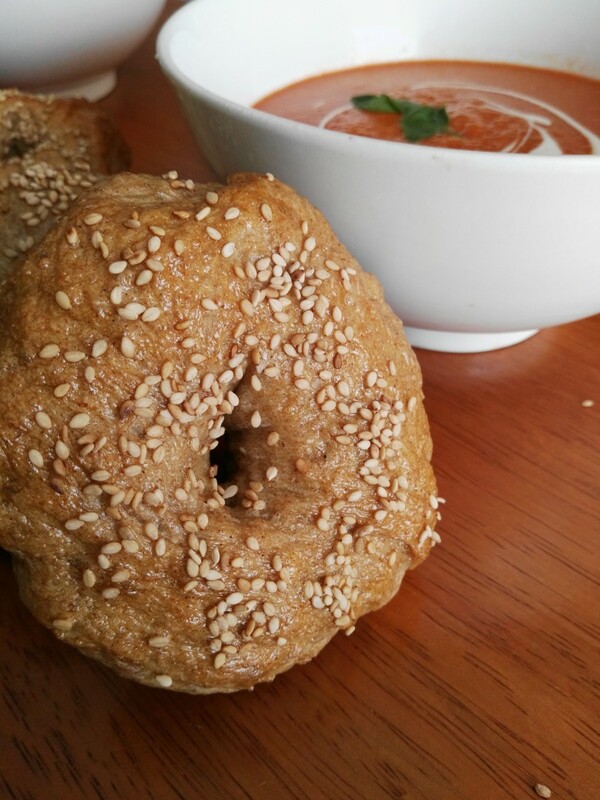 It was very interesting to read about the cultural relevance and history of the bagel; and I never knew how to make them, takes some time and work but I'd love to have some home made bagels. Thanks for the very interesting and useful information! 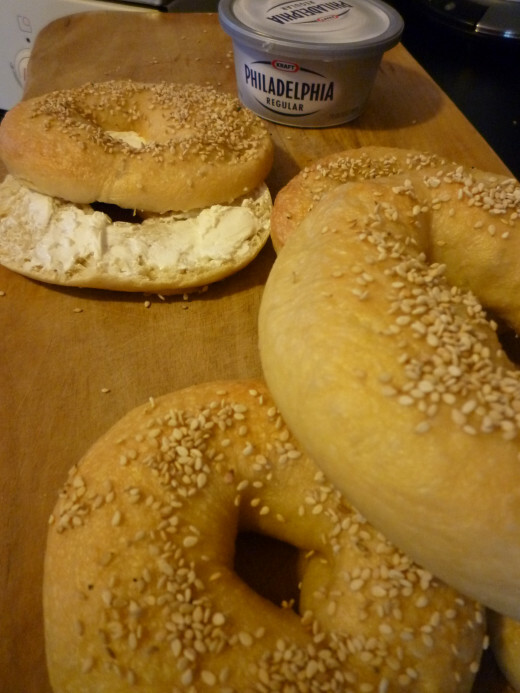 Thanks for your comments Bagels are a lot easier to make than you think and there are so many things you can do with them to spice up breakfast time.